This entry was posted in Racing on January 5, 2014 by Steve Tilford. Watching the World Cup race today in Rome, I was amazed about how few people were there to watch. I could have put the race on in a local park in my neighborhood and had more spectators. I think that the World Cup should travel around between countries, but if that is all the people that can entice out to watch in Rome, then the UCI should consider a venue change. I raced a World Cup MTB race in Rome back in the mid 90’s. There were thousands of people there watching. But, MTB was a much more popular sport back then than cyclocross is now. I’ve probably been watching too much Belgian TV, where even a local cross race is watched by thousands, but the turnout today in Rome was pitiful by any standard. I have a hard time believing that there even a question about whether they should be a World Cup in the US. We might have not have the finances to put on the race, but I would pretty much guarantee that we would have a minimum of 50 times as many spectators as there were in Rome today. I know that the UCI, and others, are looking to the US as the next big thing in cyclocross. I very much doubt that will happen. 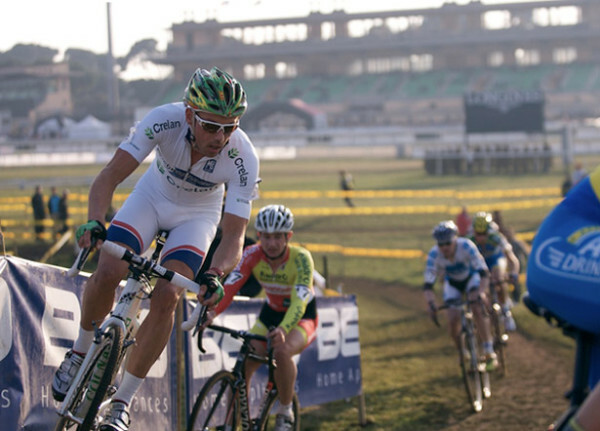 Cyclocross is a participatory sport, not a sport where it is going to have a professional circuit. There are just way too many issues that will keep it, at best, where it is currently at. The sport has no history here. If MTB racing can’t stay healthy, and it was pretty much started here, then I don’t hold much hope for cross. The country is way too big. Where cyclocross has been popular historically, countries like Switzerland, Holland and Belgium, it is very easy to do a very short drive with all your equipment to compete. That will never be the case here. It makes the costs too much initially for the sport to get a footing. It was nice seeing Katie Compton beat Marianne Vos again, when Vos has had a little more time to get back up to speed. It’s still close to a month until the Worlds, so I would count Vos out. Congratulations to Don Myrah and Henry Krammer, who won their respective Master’s events in Switzerland, yesterday and today. It is going to be a long haul back to the US, then race at altitude just a few days later. But, winning in Switzerland is much better than winning in Boulder. Okay, it is -21 out right now. It is supposed to be -38 tonight, with a high of -11 tomorrow. That is pretty cold. No skiing for sure. Dog walking in the woods might be the outdoor entertainment for the day. This isn’t this year’s race, but it is about the same amount of spectators there were again in 2014. I thought the exact same thing this morning. The turnout was pitiful and the course is lame. A World Cup should never start/finish on grass/mud. I’d like to see them move to another venue where people might show up and the course would make for more exciting racing. Although that was a nice comeback by LVDH. Italians dont do bad weather. Sad but true, the majority avoid going out when it ‘might’ rain, never mind actual bad weather with a wind. Most Italians that ride motorbikes/scooters only do so from mid spring to mid autumn. Note to Steve: Re-read your January 1 post. Your resolutions are taking a hit. Phat mc quaid thought he was invincible when he created this series ! Now he is INVISIBLE but those following are wearing the crap ? With seeing an article about ” Right of Way in NYC ” , i created a facebook page with similar intent ! Would encourage people to take a look and click ” like ” ! Losing friends due to the Bullies on the road and the incompetence of the Authorities is never easy . Reading of the loss of Harold L. , due to an incompetent driver , is never easy . Even when keeping COPY of the comment , offline , i still get nowhere ! Given up creating links as the comment goes to ” Mods “! steve, you ever get on the trainer? espically in weather like this? I am trying to understand if tracking obscure masters riders results means we care or don’t care about racing next week?